During this busy week, I've made some time for actually crocheting. I've been working on a Tunisian afghan, had to recalculate starting chain, stripe pattern and total number of rows to get it as large as I want. I also finished the "Spider doily" I made it in black for my daughter. I need to block it, might do that this evening. I've also made 4 more blocks for Warm Up America. I think the joining party is Nov. 12 at Michaels. Then last night I crocheted 8 little hats for the "Caps to the Capital" campaign. I started with the pattern from the lastest issue of Crochet Today, Oct/Nov 2006, from the article A Capital Idea by Daryl Brower. Of course, after making the first exactly from the pattern, I then had to make changes and try new things. 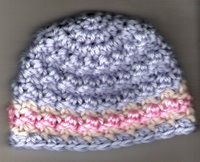 Then I started with the "Baby Shells Preemie Cap from Cay Litchfield" . That's a version using worsted weight yarn, I used Red Heart Soft. There's also "a sport weight version". One the last cap I was using blue, and was almost out of yarn, so I decided to add some stripes with the other colors that I had on hand. It really came out nicely. Yes, I realize that it's been more than a week since the last entry. That starts like confession, doesn't it? This has been a very busy week. In addition to the usual preparation for teaching, grading papers & teaching on Tuesday, crocheting in public one evening, working at the dance studio one evening, algebra homework help, and tutoring; I prepared for the CGOA meeting on Thursday evening. Technically, we're not a CGOA Chapter, yet. We've been working hard, coming up with a lot of ideas for meetings, activities and field trips, but we need 5 CGOA members to send in our application for a Chapter. This month's meeting theme was State and County Fairs. Several of us also worked on making the Halloween finger puppets that were the free pattern on Annie's Attic webpage on Thursday. Crystal & Faith made great progress on black spiders, and Crystal & I made pumpkins. They came out very cute. You can download or print the pattern free from "freepatterns.com"
I've alread started on planning for next month's meeting, our theme is Christmas ornaments. We'll start with 1 or 2 easy snowflakes, which can be made with thread, or with sport weight yarn. We've got some "newbies" who don't have experience working with thread. When I have a difficult new thread stitch pattern, sometimes I work it in a sport weight with a D or E hook. Once my brain has the stitch pattern down, it's easier to switch to thread and focus on holding the thread and working with smaller hooks. I was about to add a note to the last post, that if you click on the picture it should open in a new window with a larger picture. 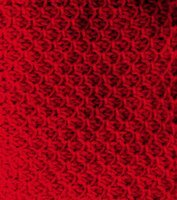 With that thought I decided I'd go ahead and scan the red honeycomb block and maybe you can see the great texture. The color is not perfect, it's a true red. I have the house to myself today, hubby is camping with the Boy Scouts. Hey, I gave up my planned crochet day yesterday to help set up a tent for the Camporee at our township park, I deserved a quiet crochet day today. I went to Michaels to see about custom framing for a table topper that I made several years ago. It was looking for a home, and I didn't have the right size and shape of table. But I got the idea to frame it and hang it in the living room as art work. It's been moved from place to place while I got it together & finally checked into getting it framed. Well, I spread it out on the counter at Michaels, and there's stains on it! I can't figure how that happened, it's mostly been laying on the top bunk in one bedroom. Will try to soak it and see if the stains come out. I did buy two different framing things for 2 small doilies that I had planned to hang with the large one. I started with a clear frame, it's basically a piece of thin plastic and a piece of glass, the plastic has a clear plastic hanger on the back. Then there are 4 pieces of silver molding that slip over the edges to hold the plastic and glass together. I put my round Petite Pineapple doily in that, #20 blue thread, about 8". It looks like the doily is floating in air! The second item is a wooden framed shadow box. It has a layer of white fabric to pin things to, the doily just clings to the fiber. This one is an oval pineapple from a vintage pattern, made with the same thread. Tomorrow I will try hanging them and see which I like best. I think I want to put them into matching frames. I'm leaning toward hoping they look best in the clear frame. I have an idea that I'd like to work up in the shadow box. Tonight I made six blocks for Warm Up America. I was practicing a new Tunisian stitch pattern from the 101 Tunisian Easy Stitches book. Isn't this pretty? 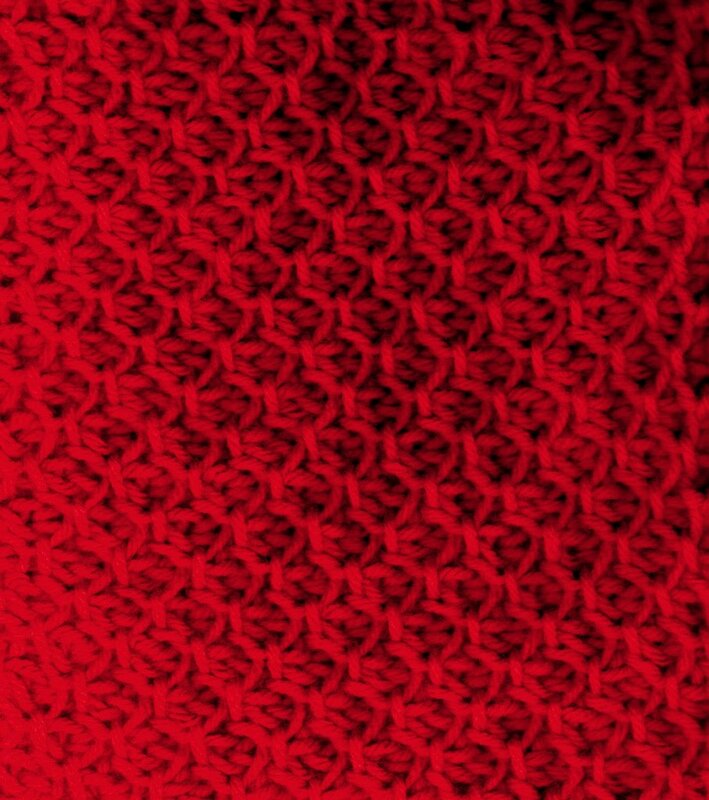 I made another in this stitch pattern, in red and white. I also made 3 blocks in a honeycomb, it's one of my favorite Tunisian stitch patterns, but I don't think it'll show in a scanned picture. I made 1 each in red, white and blue, and made a Shells & Columns block in red. Are you sensing a theme? I tried to find a red, white and blue variegated at Michaels, but they didn't have any. To bad, as the Red Heart was 2 skeins for $3.00. BTW, when is the Warm Up America Joining Party at Michaels? For some reason, I thought I read somewhere that it was the 28th or 29th of October, but several people at the Sit N Stitch thought it was Nov. 12th. Need to check that out soon. "Would very much like to see a picture of that when you're done. I love creating afghans in Tunisian crochet, but find the single crochet borders I use quite boring. Any suggestions on creating fabulous borders or any books on the subject?" The afghan that I recently finished (the entry of Oct 14) was the 3rd in a series "It's All about the Purple". That's a frequent quote at the dance studio where I work in the office. So I started making a purple afghan each year, the afghan is donated to the studio and is raffled off. This year I tried to get the afghan finished in time to display at the end of year recital. With having other responsibilites related to the recital, I ended up rushing at the last minute. I put a simple border of two rows of double crochet in pale plum, got some photos for posters, and had the afghan displayed at the recital. I wasn't exactly thrilled with that border and planned to re-do it. It just took a while to decide what I wanted to do. 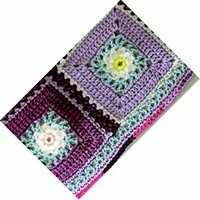 The afghan is made of squares with a flower in the center, then sage colored v-stitches to resemble leaves, then several rounds in different shades of purples, or a variegated with purple. So, I pulled out the simple border. Actually I let daughter #2 pull out while I wound the yarn into a ball! I started with a round of sage in the v-stitch, then two rounds of singles in pale plum. Then planned to put a reverse single crochet around, but as I was worked I kept thinking "something's not right". The reverse single should have created a raised border, reminds me of pie crust edge. What I was getting was a flat stitch on the side of the last row of singles. While working in the final ends I realized what was "wrong" with my reverse single, I had done a reverse slip stitch! This was done in the variegated yarn, and I really love the look. It's sort of a picture frame effect. But, my point is I tried to make the border "echo" the body of the afghan. I bought the Better Homes and Gardens Learn to Crochet, it's labeled The ultimate beginner's guide, dated Fall 2006. Not like I need a beginner's or how to crochet booklet, but I figured it could be helpful when teaching beginners, and it was only $3.99. The first 34 pages are packed with useful information - yarn weight charts with category & type, gauge, and recommended hook sizes both in millimeter and in US sizes; hook charts - in metric & US; abbreviations; how to - foundation row, basic stitches, crocheting in rows and rounds; changing colors; increasing and decreasing; finishing; granny squares; joining; and reading schematics. Then there are about 60 pages of easy projects - granny square bag, skirt and scarf; striped hat & scarf; ponchos, shrugs, wraps; a raglan hoodie (this might be on my hook, soon); a car coat; children's sweaters; baby blanket; several afghans and pillows. The sweaters, car coat, etc contain nice schematics with measurements. 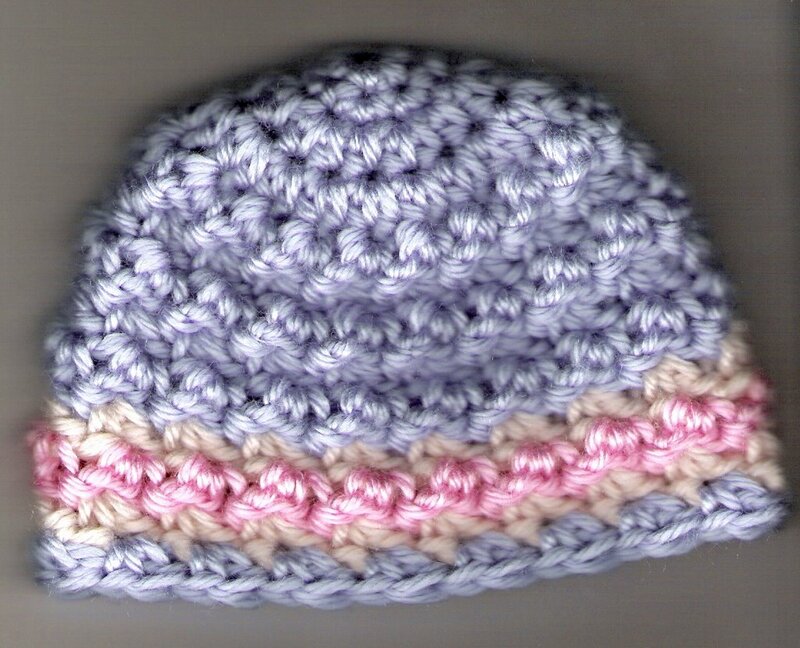 Most of the patterns use Lily or Lion Brand yarns that are easy to locate, and moderately priced. I think this contains as much as several of the books I bought not long ago for $25.00! Today was a busy crochet day. I spent the morning downloading and printing vintage pattern books from the Antique Pattern Library, while reading posts from my many online groups. 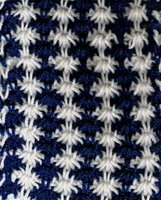 I found a motif that I like, will try that in thread, once I've finished a few of the thread items currently on the hooks. I finally got a chance to look at the magazines that have come in the mail, or that I've picked up at Borders. I had Crochet! (Nov), Interweave Crochet (Fall 2006), Family Circle Easy Crochet (Fall 2006) and I thought I bought that new magazine Today's Crochet but can't locate it now. I worked several rows on a small doily, last night I flipped tnrough several doily books to find a small one that would go with the blue one I recently finished. It's a fairly easy pattern, but I am struggling a little because I'm using a Bates hook, the Boye #7 that I needed is in the black Spider doily. Maybe I should finish that up and free up that hook! I should be able to finish that doily tomorrow evening. This evening I started reworking the border on the afghan to be raffled off at the studio. My daughter did the "frogging" while I wound the yarn into a ball. Instead of a simple round of double crochet in lavender, I put on a round of v stitches in sage, to mimic one of the early rounds in the flower blocks that make up the body of the afghan. Then I added the lavender back using 2 rows of single crochet. The final round will be a reverse single using the purple variegated. I'm much happier with the border, now. Then my daughter decided to make chocolate chip cookies, and the two of us had to run to the grocery store for a few things. At the checkout there was a little booklet that I haven't seen before Better Homes & Gardens Learn to Crochet. Read a brilliant and hilarious essay on the origin of yarn at the above link. However, notice that the author neglected one complete section while writing her paper. There is mention of Lana knitterati, the common knitter, but she has neglected an important species "Lana Crochati". Not being a scientist, I am not sure of the family, species, genus, etc. I am, however, familiar with the non-scientific aspects of this creature. Is there a scientist & crocheter out there who can give us more of the scientific information? I worked at the dance studio from 5 - 9 this evening, with some pre-algebra tutoring squeezed in. Got home at 10 pm, ready to relax in front of the tv with some easy crohceting. I checked my email, and there was a letter from CGOA. I've been accepted as a Professional Member!!! Can I still look Professional if I do a Happy Dance alone in my kitchen? Next I need to reprint my business cards, dropping the Associate between CGOA and Professional! I'm currently interested in expanding my contract crocheting/pattern editing, along with designing. I'm also interested in researching and preserving antique patterns, especially lace work and Tunisian. A Yahoo group that I enjoy being a part of is "the Antique Pattern Library". I like to select doilies, and inserts & edgings & work them up and display them in my home; I show them to friends at the Michaels Sit N Stitch, and enter them in the County & State Fairs. I hope this will inspire others to help preserve these beautiful works. Happy Dancing & singing to myself, while thinking of other ways to inspire others to crochet. That sounds pretty good, I think I'll make that the title. I found this notice posted at a Yahoo group to which I used to belong. "** In accordance with Title 17 USC Section 107, any copyrighted work on this site is distributed under fair use without profit or payment to those who have expressed a prior interest in receiving the included information for non-profit research and educational or criticism purposes only, and IS NOT an infringement of copyright. http://www.law.cornell.edu/uscode/17/107shtml ** "
While this is a legal disclosure about copyright, it does not mean what they seem to think that it means. The group is sharing copyrighted patterns, and say this is legal because they are not getting profit or payment, they are just sharing among group members, or friends. They feel this is a non-profit "educational" purpose. Sorry, they are infringing on the copyright of the pattern designers. This is reminder to please not copy and share patterns. Share the link to the website where the pattern is posted,or share the name of the book or magazine that the pattern is in. Added bonus, if we buy more crochet books and magazines the publishers realize that these items are sellable,they will produce more. For that, they'll have to buy more patterns from designers. People like me, trying to earn a few extra dollars with their hobby, or trying to expand their hobby into a profit-making business will have more sources for their design work. This Spider doily is my latest project. I had purchased a pattern from Crochet Memories to make a Masquerade Party Crinoline Girl doily for Halloween, and planned for that to be my next project. But one of the groups that I belong to, I think Doily of the Month selected this Spider doily for October. My oldest daughter saw it and liked it, so it became the next thread project. I may get a scan of progress tomorrow & post it here. In the meantime, I've finished the body of the Tunisian afghan that I was designing. I still love the look, but the Tunisian doubles do pull to the right at the top. Hoping that several rows of single crochet as a border will help pull it back into a nice rectangle. Otherwise, I may have to call it a Parallelogram afghan. Hey, I'm a math teacher! Tomorrow evening I'll try to get this border finished, also. 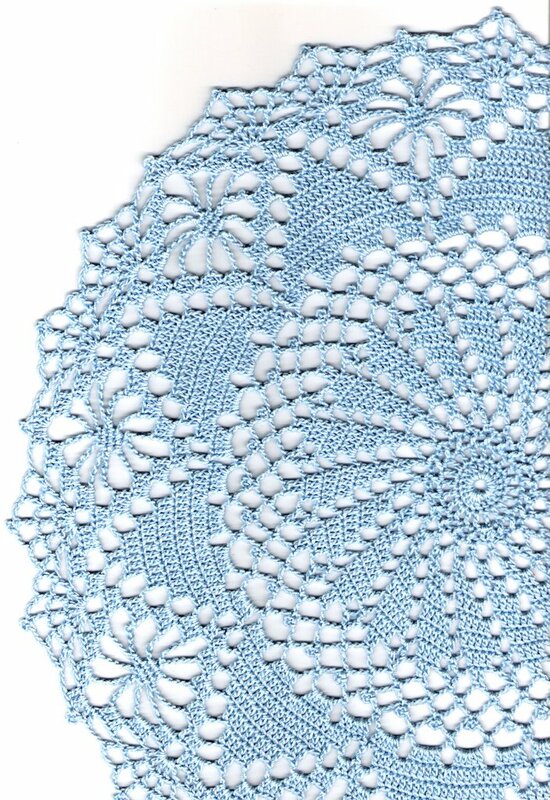 Also on the "to do" list is mail out the blue Spider Web doily. I made a few changes on the last round. 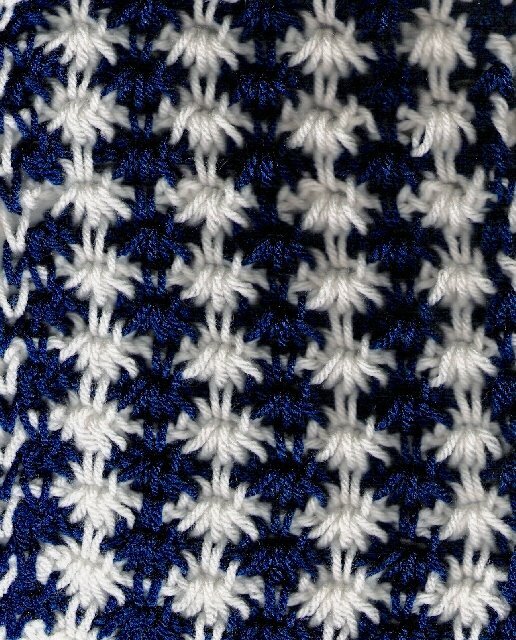 I was about half way around when I decided I was tired of fighting the slip stitch picot, I was going to make single crochet picots. I also decided that something was missing between the "fans", above the diamond spiderwebs, and decided a picot would work well there. To put that picot in the center, I added an extra double in the chain space. I really love this doily, I'm already planing to make a second. I usually don't like to make 2 of the same, I want to experience something new, a new challenge. But this worked up so nice! I finished the Crochet-A-Long doily yesterday morning, and blocked it. It dried in time for me to move it this afternoon, had to clean out that bedroom as daughter #1 is home for a week between contracts. Once she heads out, I have 3 or 4 days to move everything back to her room, as daughter #2 comes home from college for about a week. I'm starting to dream of my own craft room/studio, one wall of bookshelves for books and yarn; one wall a giant dry erase calendar with due dates of contracts, submission dates for magazines, contests, CGOA meetings, field trips; a large computer desk with space for organizing submission folders and file drawers for business files; a closet for even more yarn and supplies; since we're dream designing - a large, comfy chair with an afghan for relaxing and crocheting. Maybe someday. Meanwhile, back in reality, I've put the doily on top of the piano until I'm ready to mail it out. I have doilies back from the County Fair that are going to need washing and re-blocking due to the dust & humidity. That will have to wait, because it's time to switch gears and get together lesson plans, homework assignments, and worksheets for tutoring. It's also time to spend time with daughter talking about books, movies, music, watching tv together, and playing games.